The U.S. Communities Government Purchasing Alliance (U.S. Communities), which provides world-class procurement resources and solutions to local and state government agencies, school districts (K-12), higher education institutions and nonprofits, today made a check presentation in the amount of $50,000 to the American Red Cross through the U.S. Communities Foundation. The donation, in the form of Home Depot gift cards, will support disaster response and preparedness work. The check was presented by members and representatives of the U.S. Communities Foundation Board of Directors, comprised of leadership from the Association of School Business Officials International (ASBO), California State Association of Counties (CSAC), League of California Cities (LCC), National Association of Counties (NACo), National Governors Association (NGA), National League of Cities (NLC) and U.S. Conference of Mayors (USCM). 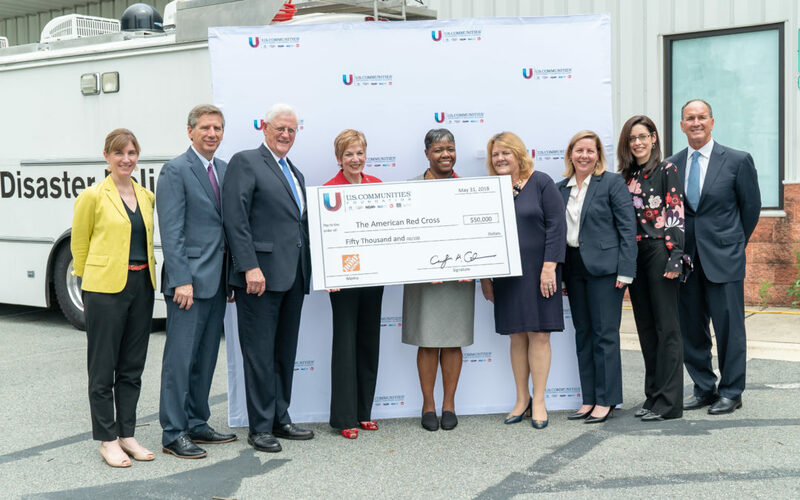 In addition to providing oversight of the U.S. Communities program, the Foundation Board members determine funding of charitable activities that directly benefit the public sector organizations served by the U.S. Communities program. The CSAC Finance Corporation and CSAC are founders of the U.S. Communities and also serve on the Foundation Board.